Gravity Forms Address Enhanced has just been released. 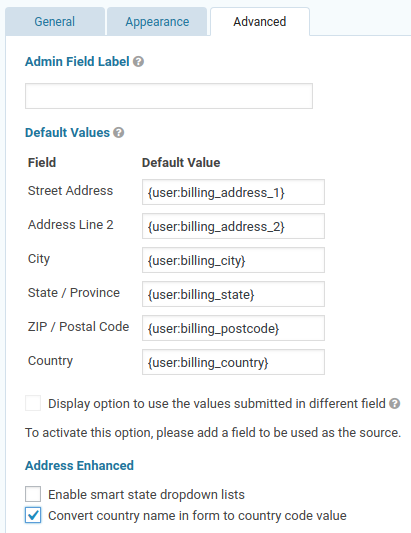 Get more out of your Gravity Forms address fields. I’ve been sitting on this for a while now. Building websites with Gravity Forms and WooCommerce has highlighted some problems integrating the two plugins, and I’ve had to solve that with some custom code. I’ve finally bundled that code up as a Gravity Forms add-on so that you can add it to your websites too. And the best news is that it works with existing forms, without having to mess around changing fields, because it extends the standard address field. Gravity Forms uses the country’s name when it saves data in its User Registration add-on. WooCommerce and many other plugins use the ISO 3166 2-character country code. Time for a fix! As simple as ticking a checkbox, either selectively on each field, or once for the whole website. Load the customer’s address from their WooCommerce customer fields, or other WordPress user fields. Once again, there’s that ISO 3166 country code versus country name problem, and once again it’s as simple as ticking a checkbox to fix it. Check out the reference website and try the live field. Better address fields are here!